It happens every year, the Thanksgiving/Black Friday frenzy ends and December’s powerhouse of holidays sneaks up while we’re still recovering. Inevitably, there is that frantic last minute shopping nightmare where going to the supermarket and buying everyone a gift card seems like the only option. But never fear, TUBE is here to help give your holiday shopping an awesome and interesting twist. Phono Select Records– This music store specializes in vinyl, and is the perfect place to buy punk, metal, and indie records. It also carries new and used tapes/cassettes, CDs, and zines. 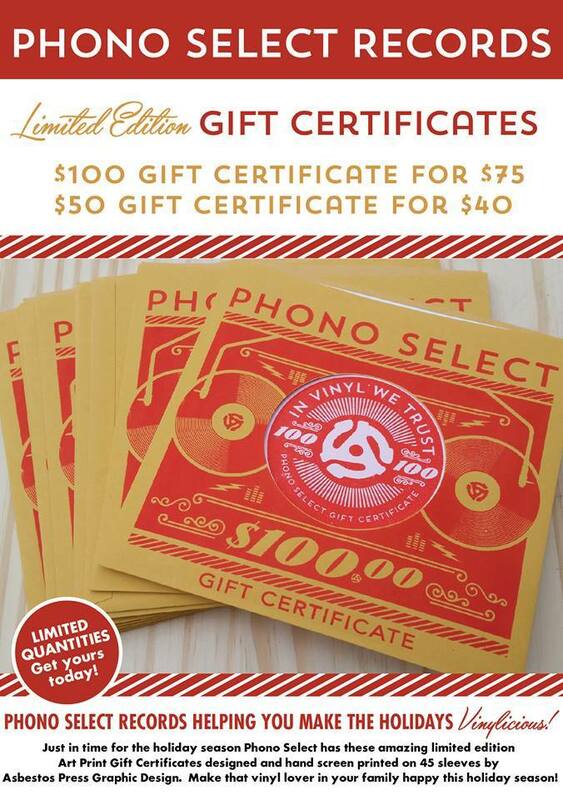 Phono Select is now offering a number of limited handmade screen prints as gift cards made by Asbestos Press. East Sac Mercantile– An ex-thrift store that now plays host to over ten different boutiques including Gigi Formals, The Bike Closet, Rire, Gigi Boutique, Holiday Shopee, Private Affair, Ali & Na, East Sac Sports & Gifts, Petite Marie’s and other retailers. Fringe– This antique vintage store carries stylish old clothes as well as curiosities and taxidermy items. While pricy, the quality is great and the selection is an adventure in itself. Scout Living– A modern vintage store that sells everything from vintage Chanel to chandeliers. Prices are somewhat pricy but the merchandise is quality. Boheme Hip Used Clothes– This used clothing store sells interesting clothes at reasonable prices. Check them out for ugly Christmas sweaters, celebrity saint candles and much more. The Pence Gallery– This non-profit gallery has a Holiday Market every year chock full of awesome craft gifts ranging from art pieces to useful items like mugs and hats at decent prices. Logos Used Books– This charity bookstore sells a great assortment of gently used books at low prices as well as a rotating selection of local art. Their catalog is variable but it’s hard to beat the $1 books in front of the store. Plus every purchase benefits Doctors Without Borders and Feed the Children. Armadillo Music– This locally owned record store sells new and used music in every format from vinyl to CD. They also carry DVDs, record players, and some used books. Their used prices are fantastic, especially the 99 cent used vinyl section upstairs. The Skirt Shack: The Sacramento based vendor sells much more then just skirts. Artist Éowyn Kelly Cole makes each item which is hand-crafted and custom made. She makes shirts, dresses, and clothing for the little ones. It is also a family affair. Her husband, Ryan Landon Cole makes hand crafted- one of a kind- jewelry. Order through the Facebook page here. Hillman Handmade: Based in Folsom, Menominee Hillman creates handmade invitations, party decor and much more through her Etsy page. Nothing is digital and the artist takes custom orders. Check them out here! Jon Buck: An freelance illustrator who has worked for Reno News & Review, the Sacramento News & Review, and done posters for bands like Desario, Metz, the Dandy Warhols, and Minus the Bear. He also has an interesting selection of non-commissioned painting and sketch. Check out more of his art here. Jared Konopitski: Local and loved, this Sacramento artist works in many mediums and is mostly known for his brightly colored and whimsical acrylic paintings. He has worked with clients such as Universal Studios, Showtime and was recently published in the New Yorker. See more of his work here. Mark Fox: Mark is a self-taught artist who uses acrylic, spray paint, and occasionally collage and digital mediums. His work is dream-like with a hint of a folk art story floating through each piece. He has shown his work in galleries world wide and is quite a fixture in the Sacramento art scene. See more of Mark’s art here. Good luck shopping and Happy Holidays from your friends at TUBE. Tags: $1 used books, 99 cent vinyl, Ali & Na, Armadillo Music, artists, Éowyn Kelly Cole, Boheme, celebrity candles, crafts, custom clothes, custom invitations, davis, Desario, Doctors Without Borders, East Sac Mercantile, East Sac Sports & Gifts, Etsy, Feed the Children, Folsom, Fringe, furniture, Gigi Boutique, Gigi Formals, handmade jewelry, Hillman Handmade, Holiday Shopee, Holiday Shopping, Jared Konopitski, Jon Buck, Jonathan Buck, Logos Books, Mark Fox, Menominee Hillman, minus the bear, Pence Gallery, Pence Holiday Market, Petite Marie's, Private Affair, Rire, Ryan Landon Cole, Sacramento, Scout Living, The Bike Closet, the Dandy Warhols, The Skirt Shack, tube magazine, ugly christmas sweaters, used clothes, Vintage. Bookmark the permalink.